In this action game you will have to fight your way through to the bosses and defeat whole armies by yourself. This sounds hard, but you will be playing the noble hero Achilles. He is very strong and skilled in the art of combat so you can easily defeat even the most dangerous enemies. 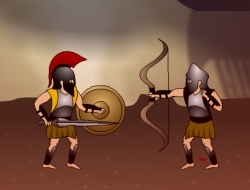 You will face archers which are best to be dealt with from a bigger range by throwing a spear at them, once you collect it from your enemies. Also you can duck and use your shield to block the enemy attacks, but watch out as they may come from both sides in an effort to try and take you down. Release your rage and defeat them all to win this war once and for all. Use the arrow keys to move and duck, T and Y to kick and use your weapon. Achilles 0.00 between 0 and 10 based on 0 votes.